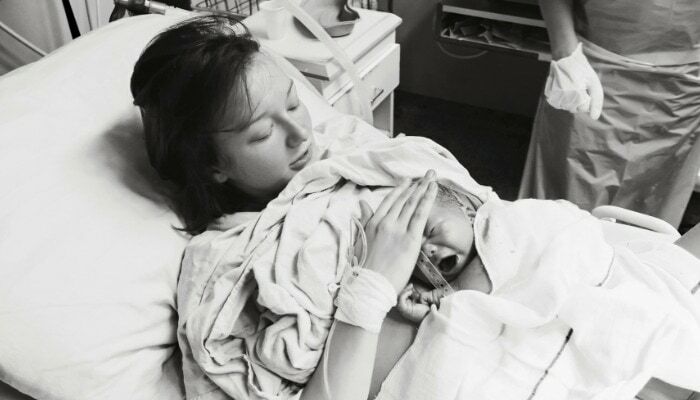 By becoming educated on and avoiding the following 10 big mistakes new moms make during pushing at birth, I believe parents will have a better birth and transition to motherhood. Before we dive in, let’s describe the goals of the pushing stage of labor. I believe that the goals of pushing are for 1) a healthy baby to descend, 2) in a reasonable amount of time, 3) while minimizing any trauma to the baby and mother. Some focus on only one or two of these goals of pushing, but I think it’s possible to do all three. By understanding the following 10 mistakes new moms make during pushing at birth, parents will be better equipped to rock these goals of the pushing stage of labor. Let’s get started! If you need some guidance on how to know if your care provider is a good fit or not, head on over here. Make sure you choose the best care provider available! I, on the other hand, view care providers as paid consultants that partner with parents to safely guide them through the journey of pregnancy, birth, and postpartum. The thing is, the former fosters passivity and an authoritative relationship, and the later fosters ownership and a partnership. Research has shown that the more a woman is part of the decision-making process during birth, she will be more likely to have a vaginal delivery AND be happier about the outcome, no matter what happens. For some tips on working with your care provider to make really good decisions for you and your family, head on over here. It’s important to make informed decisions that are best for you and your baby. 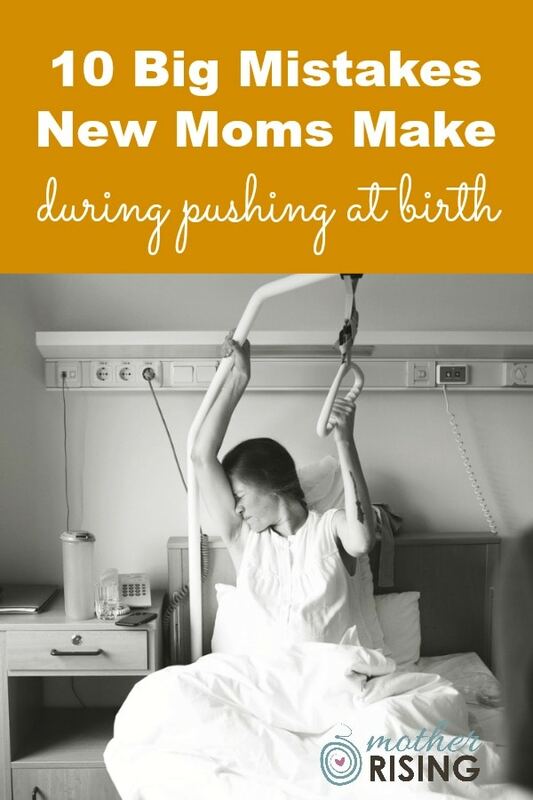 Another mistake new moms make during pushing is to expect it to be easy. Don’t get me wrong, many women actually enjoy pushing compared to the first stage of labor, because they now feel like they can do something about their contractions instead of simply cope through. However, women are sometimes surprised by the sensations of pushing because they expected pushing would be instinctual and easy. It is instinctual, but by golly, especially for first time moms, it still can be a lot of work. It’s such hard work that while pushing many women sweat, find the sensation of a cold washcloth on their forehead and the back of their neck to be helpful, and drink cold water to stay hydrated – it’s a workout! And I’m going to throw something out there that’s pretty controversial, but in my experience, not all women are able to “breathe their babies down” and just let the pushing reflex do its thing. Many women say that actively pushing during the pushing stage is unnecessary because the fetal ejection reflex will push for them. And yes, I’ve seen and personally experienced this phenomenon. But I’ve also seen and personally experienced the opposite. Sometimes women have to push, HARD, and for a long time for their babies to descend. Instead of saying pushing is and will be a certain way, perhaps its best to understand the many possibilities of pushing, without pigeon-hole ourselves to only one, and remain open to whatever comes our way. Pushing takes time. Many first time moms find themselves on either side of 90 minutes of pushing – some push for less and some more! But sometimes it takes 30 minutes of pushing for a woman to figure out what position she finds most comfortable that simultaneously makes the most progress. Sometimes it takes 30 minutes of pushing the wrong way, to finally figure out what works. And that’s pretty normal! Also, don’t forget that slow, gentle pushing is less traumatic for baby, but also for mom’s body. During baby’s descent you may notice a two steps forward, one step back sort of movement. This is a good thing! Be patient and allow for a slow, gentle unfolding of birth. Many women have found that trying different positions during the pushing stage of labor not only provides significant pain relief, but can also encourage labor to keep moving forward. But not only can pushing in a more optimal position help with pain and time, but certain positions can also help decrease the chance of tearing. Do some research about positioning before labor. Try these new moves out with a partner, friend, or doula! When it comes time for labor you’ll have the muscle memory and these positions will feel effortless and intuitive. In conclusion, instead of being flat on the back or even in a semi-reclined position, consider changing positions to hands and knees, side-lying, or even kneeling and leaning forward. There are so many possibilities! TIP: Remember to try out the peanut ball during pregnancy too! These bad boys have been shown to decrease the duration of the first AND second stages of labor. Impressive! Many women who are hoping for an epidural want one no. matter. what. – even when there are negative consequences associated with this particular choice in pain management! Don’t get me wrong, I’m not against epidurals, I just think that women should know what they’re signing up for when they get one. I’m a big fan of informed consent! If, for you, the benefits of an epidural outweigh the risks, then by all means, go for it. I support you! In my experience, one of the big mistakes new moms make during pushing at birth is to buy into the idea that perineal massage will prevent tearing during birth. Perineal massage is a technique done during the last few weeks of pregnancy and the pushing stage of labor, all with the aim of preventing tearing. But does perineal massage prevent tearing at birth? Do women need to massage their own perineums during the final weeks of pregnancy? Should women consent to this technique during the pushing stage of labor? I’m probably going to step on some toes with this one, but as many of you know, I am a big critic of perineal massage. It doesn’t help prevent tearing!! So if perineal massage doesn’t prevent tearing during birth, what does? Well, there’s a number of things a woman and her care provider can do to minimize trauma, but an easy thing to try is the use of warm compresses. Warm compresses have been shown to help decrease the incidence of tearing, which is wonderful news because using warm compresses is SO SIMPLE. Supplies Needed: All you need is warm water and washcloths. A crockpot can help keep the water warm. 24 pack of washcloths for only $16. 3 quart crockpot for under $20. Instructions: Take the washcloth, submerse it in the very warm water, wring it out and then place it on the perineum to support mom while her baby is crowning. I’ve seen warm compresses used in the hospital once and it was the OB’s idea (awesome!). He asked the nurse to grab a basin, fill it with warm water, and get a stack of washcloths. It took about 2 minutes to setup and mom was so grateful for the extra support. Using warm compresses to support the perineum is standard protocol at out of hospital births. 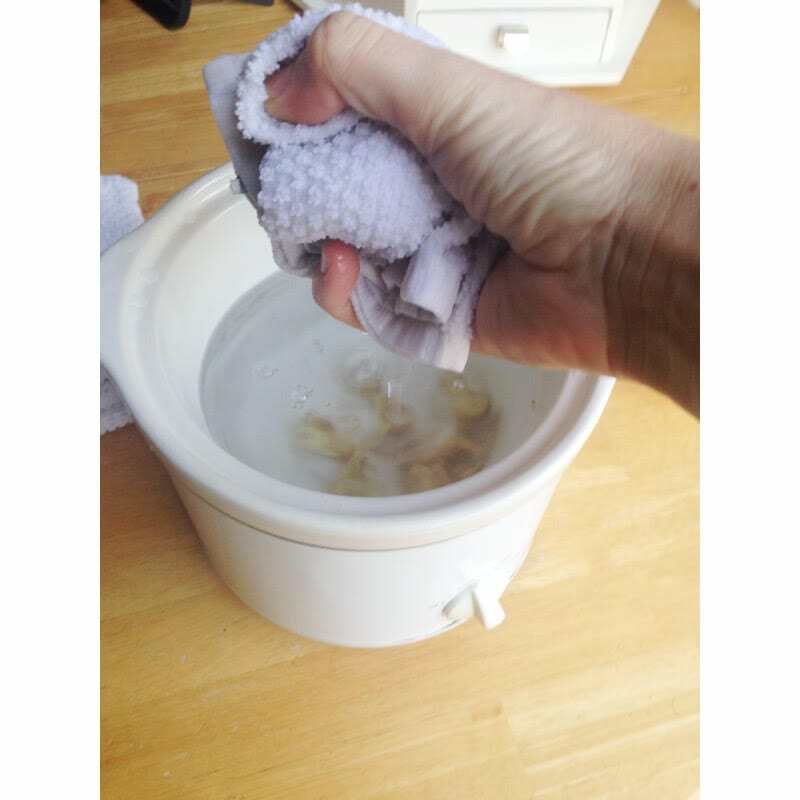 At homebirths you will often find a crock-pot filled with warm water (with a few pieces ginger in it) simmering, in preparation for the pushing stage. Ginger helps reduce inflammation and smells great too! TIP: Make sure the water isn’t hot. Once it reaches the desired temperature keep the crockpot on the warm setting. If it’s burning your hands when wringing out the washcloths, it’s too hot for mom’s perineum. BONUS TIP: Keep a stack of washcloths handy. If a washcloth becomes soiled, you’ll have a fresh one right there. 5-10 washcloths should be plenty. When in the squatting position, compared to being flat on the back, a woman’s pelvis will open 20-30% larger than it would otherwise. Isn’t that amazing?! A greater outlet = an easier birth. So of course, us Americans should squat and push our babies out just like in this video below, right? You see, according to this study (and many of the midwives I know), pushing in the squatting position greatly increases the chance of tearing. Squatting, using birth stools or even squatting with a squat bar, can lead to damage. In a nut shell, if you are the average American sedentary woman, you probably should re-think squatting when baby is crowning. Crowning is one of the most intense parts of pushing, when the top half of a baby’s head emerges from its mother. It almost looks like the baby is wearing a “crown”. Unless you’re like the 1970s Southern Brazilian Indian women in the above video that SQUATS TO REST, your body may not be able to handle it! Personally, I think it’s ok to push in the squatting position, especially if it feels good and a woman is making progress. However, once birth becomes imminent, it may be wise to switch to a position associated with a reduced risk of perineal damage: lateral positions like kneeling or hands and knees. Like I previously mentioned, crowning is one of the most intense parts of pushing. Some women report feeling a stinging or burning sensation, and most women want those feelings to go away, like yesterday. One way to make “the ring of fire” go away is to push hard and fast, getting the baby out sooner rather than later. That thought may make logical sense, but it’s not the best choice for the lady bits. When women push hard and fast during crowning, they are more apt to tear. However, when women follow the lead of their care providers and push gently, slowly, pant, or perhaps not actively push at all, a woman has a better chance of remaining intact. Yay! If you’ve read this far, congratulations! Your desire for a wonderful birth experience shows! To recap, when parents understand the following 10 mistakes new moms make during pushing at birth, parents will be better equipped encourage 1) a healthy baby to descend, 2) in a reasonable amount of time, 3) while minimizing any trauma to the baby and mother.